At the center of Cassandra Medley's play is the controversial idea that higher concentrations of melanin in the genetic makeup of people of color make them mentally, physically, and spiritually superior. Based on the scientific studies of her ironically now-deceased father, Kalima, a fledging molecular scientist looking to come to her own has a difficult time owning his flawed research. Her mother Claire, who carry's her deceased husband's scientific torch has a hard time reckoning with her daughter's enlightenment. Includes an interview with Dr. Stanley Nelson, Professor of Human Genetics and Psychiatry at UCLA's David Geffen School of Medicine. An L.A. Theatre Works full-cast performance featuring Judyann Elder, Deidrie Henry, James Pickens Jr., Jason Ritter, Terrell Tilford and Lorraine Toussaint. 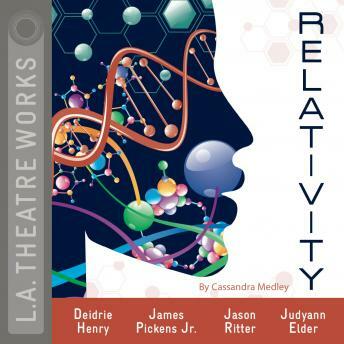 Relativity is part of L.A. Theatre Works’ Relativity Series featuring science-themed plays. Major funding for the Relativity Series is provided by the Alfred P. Sloan Foundation to enhance public understanding of science and technology in the modern world.